Read here about an artist who builds tensegrity structures. Jonathan Bolitho is an artist who works in outdoor spaces. He often collaborates with Harry Hock. In 2016 they mounted "Beneath Our Feet", an outdoor installation that featured tensegrity as a primary structural theme. Jonathan Bolitho is studying Interactive Media Art and Design at University of New South Wales. He has mounted many exhibitions such as Velo/City (2015) an interactive permanent mural as part of Veloscape, City of Sydney Initiative. UNSW Art and Design Campus Paddingto, and Spectral Shrine (2015) a group exhibition curated by Amanda Saker as part of BEAMS festival. ARCO space Chippendale. Harry Hock earned his BA of Sound and Music Design at the University of Technology, Sydney. Some recent exhibitions include ‘Attune’ VIVID Sydney 2016, large scale interactive installation in Circular Quay, and sound designer of ‘Robotanic’ VIVID Sydney 2015, large scale interactive installation in Martin Place. Beneath our Feet was an outdoor exhibition in June 2016 at [Scenic World, Australia]. Scenic World is located in Katoomba, two hours from Sydney, Australia. The tensegrity structures are simple 6 strut tensegrities bound with elastic tendons. The struts are fallen branches found in the forest. All photos by Jonathan Bolitho and Harry Hock. Tensegrity is a structural principle based on the use of isolated components inside a net of continuous tension. This principle is evident in the natural world and present in many biological and organic lifeforms. The structure is able to naturally disperse the stress placed upon it across each individual element: like an ecosystem, the structure as a whole relies on its constituent parts. 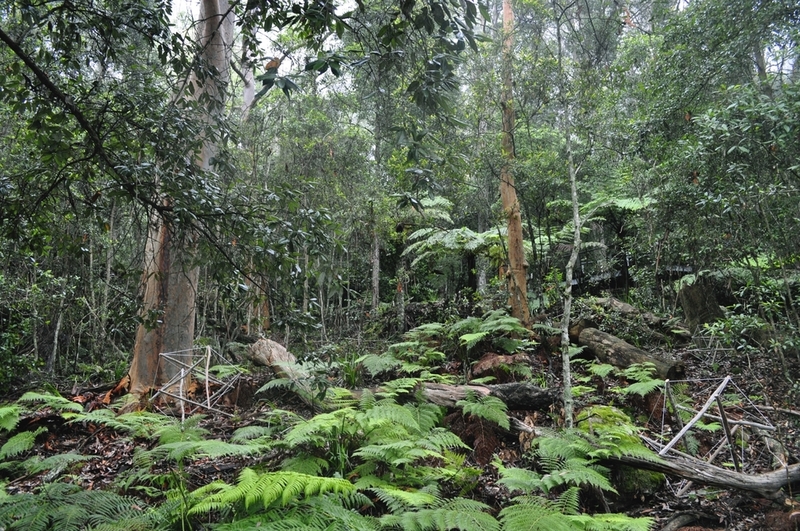 In ‘Beneath Our Feet’, this synergistic method of construction is utilised to parallel the interconnectedness of a rainforest. Elastic strands connect the found sticks in a unified symmetrical shape, while the found sticks are repurposed and given new life, mimicking both the physical structure and function of microorganisms beneath the forest floor. Over time the sculpture itself, composed of organic materials, will decompose and assimilate into the natural landscape. ‘Beneath Our Feet’ structures in Australia’s Scenic World, New South Wales. All photographs by Jonathon Bolitho and Harry Hock. All photos courtesy of Jonathon Bolitho. "Tensegrity" is the structural principle of binding isolated components inside a net of continuous tension—sort of like a forcefield, but for real physics. In Beneath Our Feet, Australian artists Jonathon Bolitho and Harry Hock use found sticks and elastic to visualize this notion of tensegrity. Like the fragile ecosystems they float in, the objects in Beneath Our Feet are under constant threat of deterioration... or full collapse. Should one of the pieces of a stick, or a band of elastic fail, the entire structure will succumb. This page was last edited on 18 November 2018, at 15:46.